Creating school audio trails is a fun way of engaging children with nature. When producing audio trails with school children you never know what the outcomes will be. You are surrounded by many creative minds, each with their own unique interpretation of the world around them and always with many questions. We are working with three schools in Staffordshire. 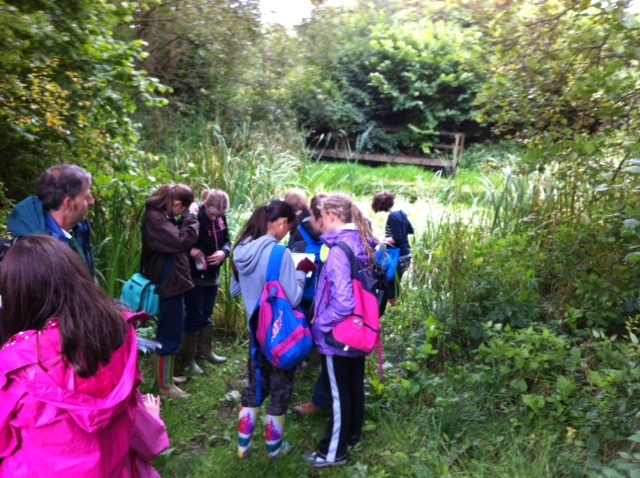 Each school has been ‘twinned’ with their local country park or nature reserve. My job is to create an audio trail with each group over four sessions. The school groups never failed to amaze me with the amount of information they could recall when we returned to the classroom – the good stuff too. However, the most satisfying part of these projects is the pupil’s creativity. With some guidance their untapped imagination can bring even the most testing points of interest to life. The scripts they crafted provided unique written interpretations, and the effort they put into the narration would impress any professional but above all the stories they continued to produce were honest. Working with school groups should always be fun. At the start of the first session we always run a little quiz based upon previous audio trails we have developed for young visitors. This helps form the concept of an audio trail in their head, and its great to see how their own trails will often build (however loosely) on one of these examples. Kids innocence, their questions and a the chance to be a bit silly (but not too much!) is why I always come away from these sessions with a spring in my step. Senior Management and the School Governors at Churnet View School were even invited to the last session to hear just what their pupils have been up to. Fortunately it was a big thumbs-up and feedback from the pupils and teachers was wonderful. Moorside High extended the project and produced this video from footage they shot during the visits. If you would like us to create an audio trail with a local school please contact us.